While rooftop is catching flare all around the globe, we have a new technology that integrates solar into the roof of your house increasing the home aesthetic. This option is available in various colors too. According to Forward Labs, this technological innovation can be simply put as “solar and roofing as one”. 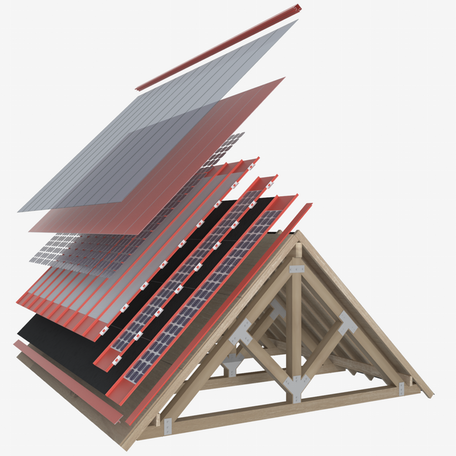 This is the first solar product fully integrated into the roof, the solar panel is almost indistinguishable from the roof structure. Located in New York, the services are being provided at Connecticut, Rhode Island, Columbia, New Jersey, Delaware, and Maryland, parts of Massachusetts and Virginia currently. It is achieved by combining solar technology with an optical layer. The structure is so designed so that there is enough space between the panel and the deck of the rooftop for passage of air. This air helps the panels cool down during hot summer days, thus increasing the overall efficiency and reducing over-heating. The panels are designed to be integrated on the southern facing portions of the home, the other parts of the roof will have matching standard metal application. This increases the efficiency without compromising the overall look of the rooftop. Read more about Solar Roofs. This will be a new technological breakthrough in the solar industry and will change the way the rooftop industry works. The biggest concern is the cost of this system, which is almost double than the normal rooftop installation. The roofing cost is approximately $7.5 per square feet. To this is added the solar energy output cost, which is ~$7800 per kW. This will be the total cost of Forward Roofing system before tax breaks and incentives. Read more about Solar Shingles. The solar industry is getting exciting with each passing day. Given its green credentials and falling price, it is becoming a natural choice among masses. This new technology integrates not only the positives about solar but also improves the overall look and aesthetic of the property. This could definitely be termed as the “new solar luxury” in the current market. Roof top Cleaning, I think by using a leaf blow works the best. Water and a rake can do to much damage. Blowing from the ridge downward will remove a lot of deris from your roofing. This also works great for the end of the new roof job.